It's been something of a poorly kept secret that I started formulating a review system just for the Ani-TAY team here on Talk Amongst Yourselves. Today the fruits of my work are revealed to anyone who wants it. The header image comes from mdub's Ani-TAY review article which used an early iteration of this package. It is mentioned below as the prime example of this system in action. Update (1/10/15):This system was updated. You can find the new one here. This system is basically a guideline that can be used in your own review system. You have full rights to alter the assets in any way you want. The only thing you cannot do is call it an "___: The Ani-TAY Review" unless you use it exactly as described here. Anything up until that point is fair game. I started Ani-TAY's review system just a week or so before TAY's official review system came out (timing was convenient on that one). Anyway, after the official format came out, it was very similar to what I was making. Since the assets for TAY's review system were excellent, I decided to just adapt it to Ani-TAY's needs instead. The system is almost the same as the official TAY system. You put the Ani-TAY sticker on your header image (resizing it so that it doesn't seem too overpowering if need be) and you're already using the system. I'd love it if everyone on Ani-TAY used the Ani-TAY review button for their reviews to give us that cohesive feeling. That said, there are no hard feelings here if you decide to not use the other two parts (the headers and the review card). Ani-TAY is a diverse place with a lot of niche in it and everyone has their own system. Even I (the person making it) do not entirely follow the system. 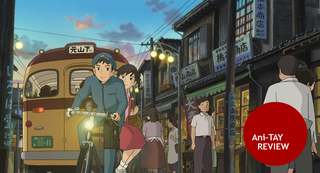 Those that do, however, should go and look at mdubs' From up on Poppy Hill review for the general format. Mdubs followed the early version of the Ani-TAY system excellently. 1. The title will be "Name of the Anime: The Ani-TAY Review". You italicize the name with < i > and < / i > HTML tags. Get rid of the spaces. 2. An indicative image of the anime you are reviewing that conveys the show in a manner you see fit (see header image for this article). 3. An introduction section where you explain the setting and basic starting plot of the anime. 4. The three major header sections. You may drop specific sections at your own discretion. There have been many amazing video game sound tracks composed, butJerkosaurous has the best one my ear balls have ever heard. The classical approach to dub step is both inspiring and confusing (in a good way). Sometimes I would just sit and listen to the beautiful sounds, produced only by blowing on jugs, until I fell asleep. 5. The end of the review will be denoted by the "Conclusion banner" closely followed by the Review Card. The review card is populated by a whole mess of aggregated information and one of three "ratings": "Go for It! ", "Proceed with Caution", and "Not Worth Your Time". This is, again, adapted from the TAY Review system. It should be followed up with the appropriate conclusion section and then that's all. Your article should be tagged with "Ani-TAY", "The Ani-TAY Review", and the name of the anime (if there are multiple names, use your own discretion) to promote cohesiveness among Ani-TAY. Unlike the TAY Review format, I am going to trust the judgement of Ani-TAY when it comes to a reviewing schedule. If you see someone else has posted the same review as you, you can still post it, although I would suggest altering the title to something other than "The Ani-TAY Review". We're a small sub-community of TAY and I think we all get along enough to keep this simple. GIMP is a free image editor that I use in the place of Photoshop. You can get it at Gimp.org. There are builds of GIMP for Mac OS X, Windows, and various Unix-like systems. You'll find information on how to use the package in the readme.txt I have included inside. You are free to use any elements you want from this package. Personally, I have started using the Ani-TAY Review button and the review card while continuing to use my own title scheme and category layout. This is seen in my The Princess and the Pilot review. You can do the same thing. Pick and choose which elements you want to use. The only thing I ask is to only make it a true Ani-TAY Review (with the "The Ani-TAY Review" tag and the title) if you follow this system completely. If we allowed "The Ani-TAY Review" articles that completely jettisoned this system, then it would be a bit confusing. At the end of the day, this is an assets package. It was designed to give people a heap of assets that looked good. If you want me to custom-tailor anything for you, just ask and we can work it out. There isn't much of a purpose to the package beyond that. The "Ani-TAY Review" thing was a side-note that I made to give everyone something to work off of. Since I made these assets, I decided to share them. That is all.